4 slices white bread NO CRUSTS. Mix all together in container until it begins to stick together. Empty out on a board and knead until smooth. Wrap in Saran wrap and store in fridge. Use as clay. 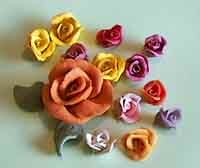 Cut with cookie cutters, sculpt with it, make beads - anything you like! Finished articles can be painted and varnished. This recipe will keep for ages. I tested a ball wrapped in Saran and kept in the fridge, after two months it was still as good as new. 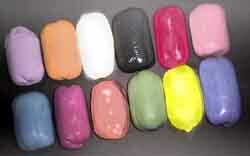 Add the colour as it is more pleasing to work with and also makes a good base for painting.